My Mom was, by leaps and bounds, the most avid of tea drinkers. She started drinking tea before she was old enough to attend school and she usually had at least three cups a day. Throughout the 86 years that my Mom lived I’d imagine she likely drank close to 100, 000 cups of tea but Mom was a purist. It had to be orange pekoe which to my understanding is a young, top-leaf, black tea. She insisted the water be at the perfect temperature. Milk was to go in the cup after steeping. Her reasoning was that putting it in before the tea was brewed would take the water too far off temperature and ruin the cup. I always waited to see her reaction when she ordered tea in a restaurant. More often than not, a little stainless steel teapot would arrive with a tea bag sitting in hot, not boiling, water. A whitish foam would grace the surface. Sometimes it was even worse and the tea bag was still in its wrapper beside the tiny teapot. Mom would grimace and then call the waitress over. There was more than one occasion where my Mom ended up going into the establishment’s kitchen to teach the staff how to brew a proper cup of tea. Mom would tease me about the herbal “teas” I would make my way home with. “That is not tea,” she would remark emphatically. Of course, Mom was right because many of those teas didn’t contain any tea at all and are referred to as tisanes. However, I loved the different flavours and endless varieties. Loose teas and tisanes were always my preference over plain old black tea. One of the things I missed when we moved to Brant County was the proximity to a great purveyor of loose leaf teas. When we lived closer to the St. Jacobs I would venture out every few weeks to indulge myself at the tea seller who had a stall in the famous market. I hadn’t been there since we moved here in 2007. Back in October I went on a little excursion with my friend Carla and we ended up at a great little tea shop called Sandalwood Tea Company. It is located on Fairview Drive in Brantford. I have to admit I was like a kid in a candy store. There must be at least two hundred varieties of tea all neatly displayed in very large glass jars. It is such a welcoming little place filled with all sorts of gorgeous tea accessories and, of course, some of the most delectable teas I’ve ever tasted. I noticed almost right away that the sweet little British lady who ran the shop must use one of the same suppliers that the tea vendor in St. Jacobs sourced his teas from. There it was, my son’s favourite tea, Blue Eyes. Blue Eyes, inspired by Sinatra, is a kid-friendly fruit tisane that contains dried apples, rosehips, hibiscus, cornflower petals, and natural flavours. It has a hint of a caramel flavour to it and tastes slightly sweet without needing to add anything. It makes wonderful iced tea and popsicles. My favourite, aside from an Earl Grey with a little extra Bergamot added, is a toss-up at the moment. I seem to be wavering between several of them. 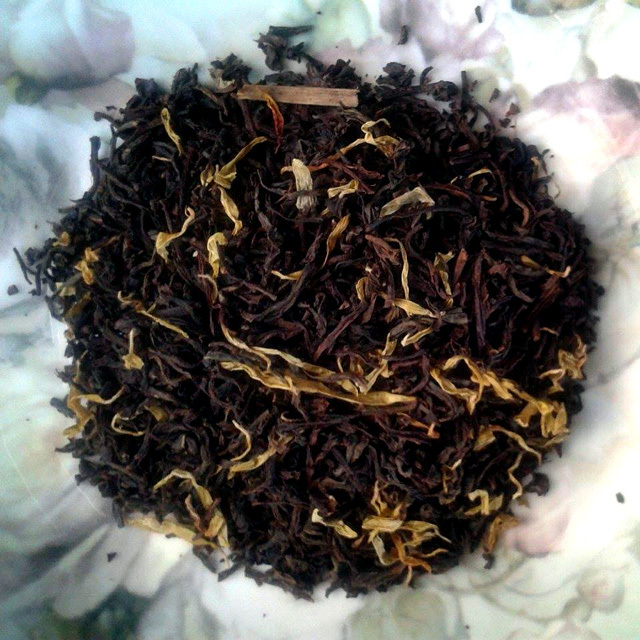 I love the Lemon Cream Black Tea which is an orange pekoe blended with calendula blossoms and natural lemon flavours. It is a very comforting yet bright flavor combination. I quite enjoy the Pear Cream Black Tea that contains apple pieces, fennel, orange peel, calendula flowers and natural pear flavours. The Black Forest Cake Organic Black Tea is a great afternoon treat. It contains Ceylon black tea, carob, cherries, juniper berries, rose petals and natural flavours. The one I drink most though… simple hisbiscus blossoms which have a wonderful citrus note to them and leave the water a gorgeous hue when steeped. This one also makes a beautiful iced tea. I’d love to hear what your favourite teas or tisanes are.